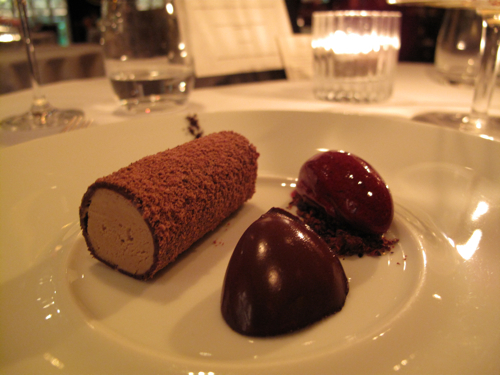 Many were surprised to find Marcus Wareing missing from the list of elusive 3-star restaurants when Michelin released its 2010 guide earlier this year. The rise of this once Gordon Ramsay protege has been meteoric to say the least ever since a very ugly and public divorce which saw the ex-best mates fall out and go their separate ways in 2008. I’ve said it before, I really believe the best time to catch a restaurant at its prime is not when its already achieved accolades galore, but when its still hungry for more… and hungry on that Bank Holiday Monday we were. 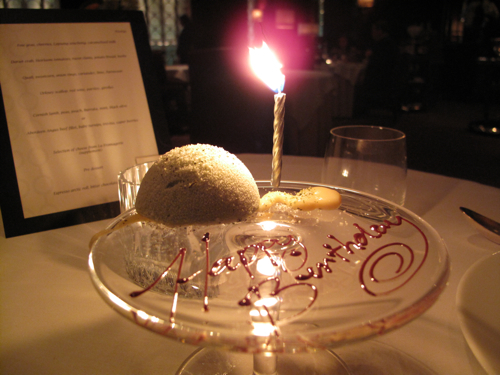 It was Jo’s 25th and we were looking to be seriously dined and wined out, double Michelin-style. The plush velvet and dark mahogany interior of the Berkeley’s dining room exudes a feeling of decadence like no other. 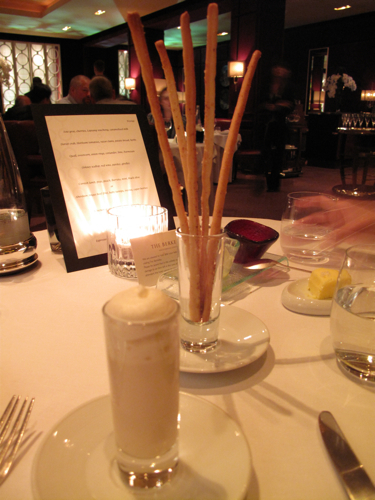 From the get go, towering nutmeg-flavoured breadsticks and an air-light amuse bouche of apple and ginger foam were a showcase of the quality and wonderful flavour combinations that were to come. 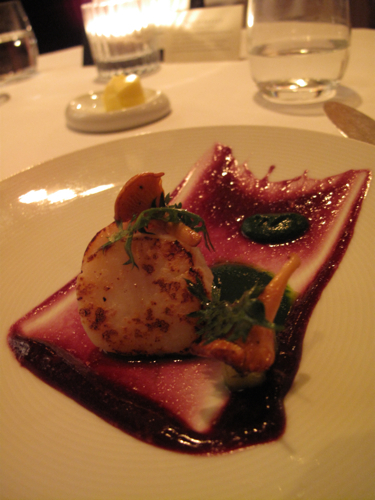 This is as haute as haute cuisine gets, so rather than subject you to a 7-course degustation of raves, I will instead let the photography do the beauty parade and and round up with some after-thoughts of the evening’s high notes as well as its mediocrities. Dishes-wise: Although it was hard to fault any of the dishes, there were two that stood-out amongst the crowd. It takes a brave chef to kick off proceedings with a Foie Gras starter whose accompanying ingredients have dessert written all over them. 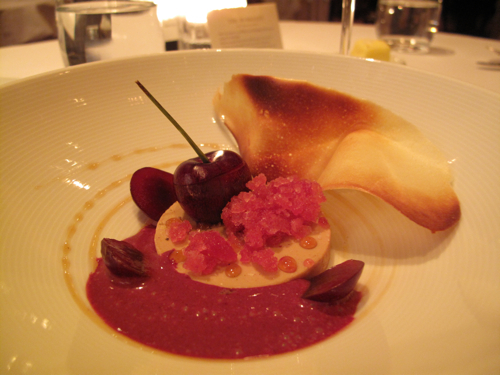 To my surprise though, the sweet ‘n sour tang of the Granita and fresh Cherries as well as the soothing Lapsang Souchong-infused sauce worked incredibly well to cut through and fade out the richness of the Foie Gras. A wonderfully indulgent start which was made even more perfect by the sweet Santorinian red it was served with as part of the wine flight. 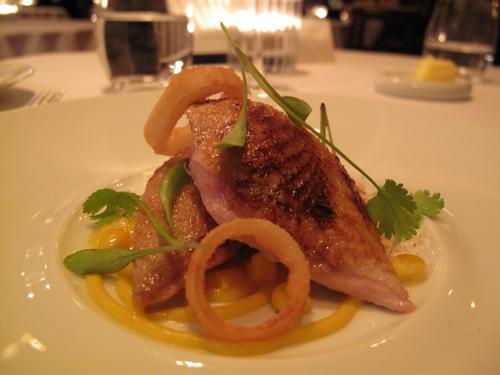 Even better though was the Quail – a playful, inventive dish of wildly varying flavours. The brain struggles momentarily to interpret why one is eating a beautifully cooked breast of game meat with Sweetcorn, Lime and Parmesan. But with each passing bite, the deconstructed flavours of sweet, sour and savoury soon amalgamate. 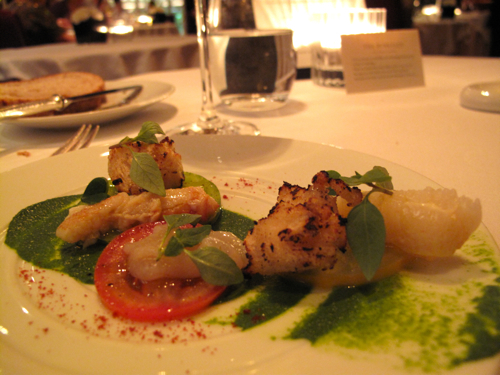 Add to that the textural crunch of the Onion rings and fresh zing of the Coriander and you have one heck of a dish that showcases the cutting edge originality and complex yet harmonious flavours of Marcus Wareing’s food. 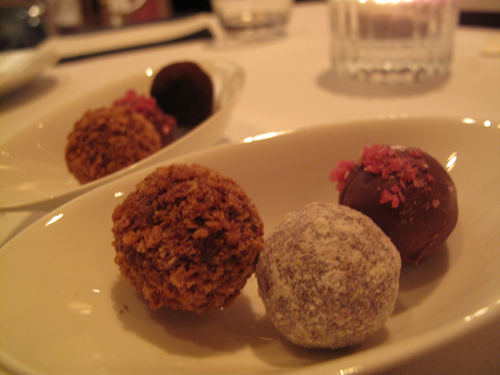 The Petit fours trolley: It’s impossible to miss the majestic chandelier-like Petits fours cart as it glides around to diners as they are wrapping up their meals. Deep, gleaming diamond-cut crystal bowls of goodies with flavours ranging from Banoffee to Turkish Delight to choose from. A supermarket trolley from the heavens. The Mojito granita: A pre-dessert ‘mini-me’ Mojito, served in a shot glass which sets the benchmark for all palate cleansers to follow. Dishes-wise: Maybe the bar was set too high by the Foie Gras and Quail, but I found the main event itself a little anti-climatic. 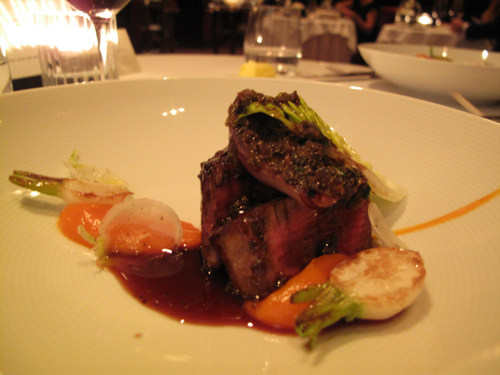 Though the Beef fillet was extremely tender and cooked to medium-rare perfection in a very decent caper berry sauce, it lacked the wow-factor and fireworks of the earlier courses. 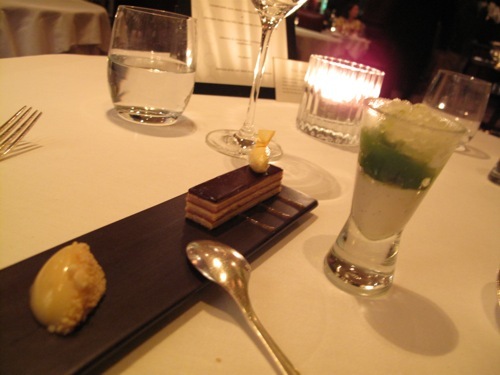 Service: Though professional and attentive on the whole, we found the front-of-house a little clumsy on one or two occasions. For instance, despite us having placed our orders already, we were asked a second time if we needed any “help” to which I simply replied in mild confusion: “no, we’re quite alright”. A leee-tle bit awkward… Also, one of the waiters found himself having to apologise to Jo after whisking away my finished plate while she was still in the midst of eating (twice!). In fairness, he looked mortified at himself when he realised his mistake and the apology was completely sincere with a good, reassuring dash of humour that he wasn’t trying to get rid of her. All in all though, this was easily some of the best food, if not the best we’ve had all year. A worthy venue for that special occasion and I hope to be back someday after it gets that 3rd star it deserves. Yes, that Mojito granita was a tribute to all Mojitos.